rotherham business news: News: AMP at the "heart of the North’s economic renaissance"
News: AMP at the "heart of the North’s economic renaissance"
The strategic economic importance of the Advanced Manufacturing Park (AMP) in Rotherham has been highlighted at the official launch of Peel Logistics. Harworth Estates, the company created to realise the property assets of what was UK Coal, entered into a strategic marketing alliance with The Peel Group earlier this year with the aim of becoming a key player in the logistics market. Based on the AMP at Waverley, Harworth Estates is one of the largest landowners in the UK with access to over 30,000 acres of land. Key sites include Rotherham (Waverley), Bolton (Logistics North), Nottinghamshire (Harworth) and Pontefract (Prince of Wales). Leading infrastructure, transport and real estate investment company, Peel, has a 32.82% share in Coalfield Resources plc, which in turn owns 24.9% of Harworth Estates Property Group Limited. The newly created Peel Logistics brings together 66 sites across almost 6,000 acres of land. 17 sites are brought to market through Peel's strategic alliance with Harworth Estates. The companies will continue to market their own sites individually, with Peel Logistics providing a marketing umbrella for the UK-wide portfolio. Local sites that come under the Peel Logistics portfolio include AMP and Waverley in Rotherham (pictured), Sheffield Business Park and Doncaster Sheffield Airport. Approved in 2010, the largest, most complex, planning application ever considered by Rotherham Council gave outline approval for South Yorkshire's largest ever brownfield development at Waverley, creating a new 3,890 home community across 741 acres. 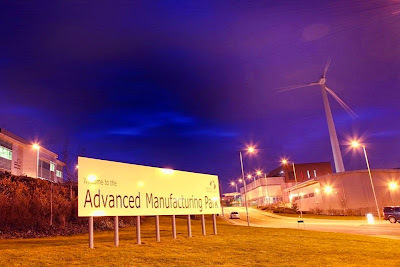 Developed first on the site of the former Orgreave colliery, over half of the AMP's 150 acres has been developed over the past ten years and is home to global manufacturers such as Rolls-Royce and Boeing, alongside high-value SMEs including Dormer Tools and Sandvik. Products developed and built at Waverley include parts for the Dreamliner and Bloodhound SSC – the British-built car bidding to become the first land-based 1,000 mph vehicle. Iain Thomson, partnerships manager for Harworth Estates, said: "Logistics needs to be thought of as going beyond simply "storage and distribution for retail" and to encompass the supply chain requirements of high-value local economies. AMP will enable "just in time" supply chain management to support the growing automotive and aeronautical engineering sector. "The AMP also sits within one of the most successful Enterprise Zones in the UK. The Sheffield City Region Enterprise Zone was ranked as number 1 for foreign direct investment (fDi) strategy in March by the Financial Times and sits alongside others such as the Discovery Park Enterprise Zone in Kent at being at the heart of the Country's improving economic growth. "Demand for space is extremely high and we are now bringing forward plans on a further 27 acres. By the time it is fully built out, Waverley will have over 5,000 people employed on the site with an estimated GVA of £300m per annum. "We are confident that the development of the Advanced Manufacturing Park at Waverley will become a site at the heart of the North's economic renaissance."